EVOLUTION IV is the next High Resolution Ink Jet Printer in the EVOLUTION series and has also been designed around the thermal ink jet (TIJ) technology proprietary to Digital Design. EVOLUTION IV as with its predecessors, delivers the lowest TCO (Total Cost of Ownership) of any competitive ink jet printing system available. Our EVOLUTION Dot Calculator can show you how low your TCO can be. 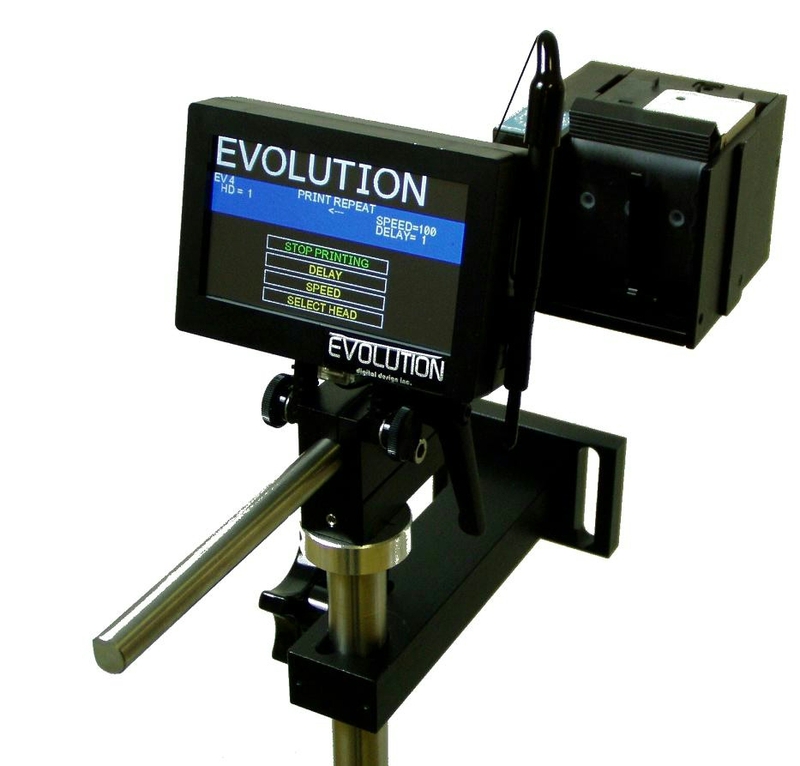 EVOLUTION IV is delivered as a complete system and includes a Touch Screen Controller, print head module with built in product sensor and a flash card reader, mounting bracketry, and power supply. EVOLUTION IV will print bold, highly legible characters in a resolution of 300dpi or at production speeds up to 110 feet per minute (33.5m/min). EVOLUTION IV can print and store user created graphics(logos) in bitmap (*.bmp) format. EVOLUTION IV has the ability to print one line of 1″(25.4 mm) high characters, two lines of 15/32″ (11.9 mm) characters, three lines of 5/16″ (7.9 mm) characters or four lines of 7/32″ (5.5 mm) high characters. EVOLUTION IV includes the standard font Arial, Tahoma, Swiss and Outline style fonts are available as options in a variety of character sizes. EVOLUTION IV has from simple product identification to date, time and sequential numbering to barcodes and graphics, the EVOLUTION IV has it all in a compact, simple to use High Resolution Ink Jet Printer. The ADD-ON PRINTHEAD is used when additional lines of text or product information need to be printed on the carton or product. 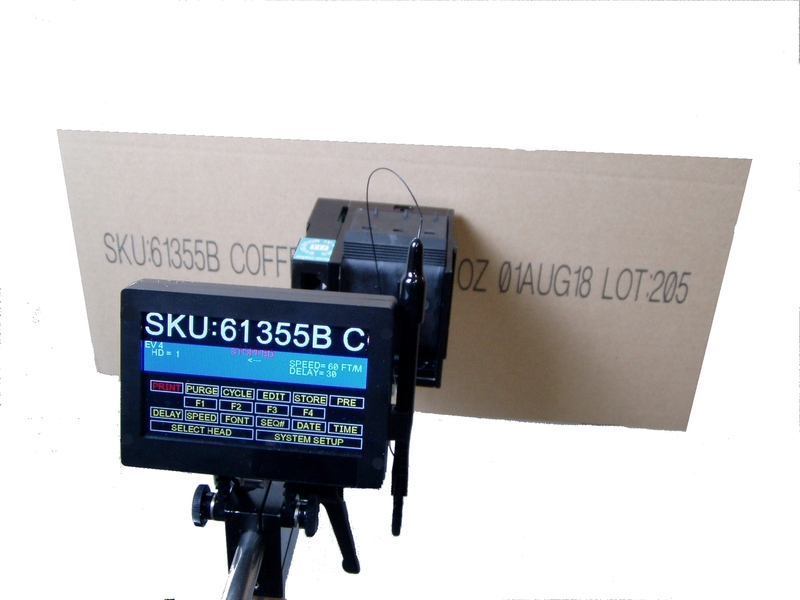 It includes the print head module, 7-inch communication cable and a power supply. The print head module simply slides on the existing print head using the dovetail slide and slot on the sides of the print head. A setscrew locks the print head modules into position. Up to two print head modules can be mounted onto a single mounting bracket. The 7-inch communication cable is inserted into the appropriate port on the print head to allow communication with the controller. It can also be used on additional line production lines within the manufacturing facility. It includes the print head module, power supply and a mounting bracket assembly. A communication cable of the appropriate length must be ordered separately if connecting the additional print head modules onto a network of EVOLUTION printers. Also available as options are Swiss Style, Tahoma Style, and Outline Style.